The Bible is and has been the #1 best-selling book in the world. And this count does not include the sales of the Tanakh (Jewish Bible), the New Testament or other portions of the Holy Scriptures, such as the Psalms. Since the Bible Society began keeping count in 1816, the estimated number of Bibles printed is more than 6 billion in over 2000 languages and dialects. Currently the Bible is selling at the rate of about 100 million copies per year. Why is the Bible so popular? Here are some reasons. It Is The Word Of God. The Bible declares itself to be the Word of God, recording that “the Lord said” and “God said” at least 1158 times. In a very real sense, it may be said of the whole Bible, as it was said of the Ten Commandments, that “the writing was the writing of God” (Ex. 32:16 NKJV). This truth is reiterated in the New Testament when it says, “All scripture is given by inspiration of God, and is profitable for doctrine, for reproof, for correction, for instruction in righteousness” (2 Tim. 3:16). Jesus said, “Heaven and earth will pass away, but My words will by no means pass away” (Mk. 13:31). Can the Book of Mormon, the Koran or other so-called holy books claim to be infallible or divinely inspired or the eternal Word of God? The Scriptures have come to us in the same way that natural life came to Adam when “God … breathed into his nostrils the breath of life.” This breath of life made him a “living being” (Gen. 2:7). So also, the Word of God from His mouth “lives and abides forever” (1 Pet. 1:23). It gives new life and sustains that life in the believer. The Lord Jesus said, “The words that I speak to you are spirit, and they are life” (Jn. 6:63; Dt. 30:10-16). This is why the Bible can discern “the thoughts and intents of the heart” (Heb. 4:12), convict people of sin (Rom. 7:7) and convert their souls (Ps. 19:7). While some books may direct whole nations in their political ideology, and others inspire or entertain many, only the Bible penetrates the mind, heart and soul of those who read it. When God’s Word convicts the conscience and heart, it brings about conversion and makes new birth possible (Jn. 8:6-9; 3:5). It then becomes the guide to lead us into peace with God (1 Jn. 1:9) and right relationships with others (Ps. 119:105). No other book can do this. It Pertains To Past, Present, Future. The Bible is the most historically accurate document in the world, because it was written by God’s direction (2 Pet. 1:21). If a person reads the history of the American Civil War as recorded by authors from the North and the South, the “facts” differ due to their differing viewpoints and opinions. Their writings cannot be completely trusted. But this is not so with the Word of God which claims to be entirely true: “The entirety of your Word is truth, and every one of your righteous judgments endures forever” (Ps. 119:160). And it can make this claim because its Author is recognized as all-knowing: “Known unto God from eternity are all His works” (Acts 15:18). While men have attempted to attack the reliability of biblical events, names and places, archeological digs have consistently confirmed the factualness of the Bible record. Archeology does not prove the Bible; it is the Bible which sheds light on archeology. The Scriptures are timeless, up-to-date and very much present-time oriented. A close reading of Romans 1:19-32, written over 2,000 years ago, unnerves the reader as it so accurately describes conditions today. Throughout the New Testament, instructions are given for right living for today, both toward God and others (1 Tim. 3:13-14; Rom. 12:1-21). The Old Testament, especially the history of the Israelites, was recorded for our present learning (1 Cor. 10:11), and Proverbs refers to itself as a timely book of wisdom for all to follow (Prov. 4:20-22). No other writing is so consistently current. Furthermore, biblical prophecy – information related to the future – is also proven to be trustworthy. Of the many future events predicted by Daniel in minutest details (Dan. 2:31-45; 4:4-37; 7:1-8:26), those that have already happened prove to us that those still unfulfilled can be trusted as true as well. There are over 300 prophecies that foretold the coming of the Messiah, and most were written many years before Jesus was born in Bethlehem. Of these many pronouncements, there were about 100 that only Jesus Himself could have fulfilled. We can trust the Bible because no other writing claims such prophetic accuracy, truth and fulfillment. It Exposes And Solves Man’s Problem. Some books realistically describe the human condition with all its successes and failures. While Lord of the Flies, an allegorical novel by Nobel Prize-winning author William Golding, describes in great detail how man-made culture fails, the Bible, in one short statement, provides the reason for man’s failure: “The heart is deceitful above all things, and desperately wicked; who can know it?” (Jer. 17:9). Disobedience to God’s Law (Rom. 5:19), rejection of His Word (Jer. 6:19, 8:9) and refusal to accept His Truth (Rom. 1:18-32) have caused all of man’s personal, cultural and worldly woes. What was said of King Saul – “Because you have rejected the word of the LORD, He also has rejected you” (1 Sam. 15:23) – reverberates down through history from Adam to the present. Only God’s Word describes man’s problem so succinctly and accurately! The Bible shows that God sees us and expects us to follow Him (Gen. 16:13). God’s Word promised life and prosperity in Old Testament times, both individually and nationally: “You shall therefore keep My statutes, and My judgments, which if a man does, he shall live by them: I am the LORD” (Lev. 18:5). Even the wicked city of Nineveh was spared for about 400 years when its people repented of their wicked ways and listened to God’s Word delivered by Jonah (Jon. 3:5). However, the Bible shows that sinful man could not then, and cannot now, keep God’s Law – His pattern for right relationships between a person, God and other people. But passages in both Old and New Testaments provide the solution to man’s inability to keep the Law: “The just shall live by faith” (Hab. 2:4; Rom. 1:17; Gal. 3:11). This faith is found in Jesus Christ, “who gave Himself for us, that He might redeem us from every lawless deed and purify for Himself a special people, zealous of good works” (Ti. 2:14). He forms within us a new relationship with God (Jn. 17:20), and provides the power for proper relationships with others (Eph. 2:14). The power for right living comes by the Spirit of God so that we may say that “the life which I now live in the flesh I live by faith in the Son of God, who loved me and gave Himself for me” (Gal. 2:20). The Bible teaches that “as sin reigned in death, even so grace might reign through righteousness to eternal life through Jesus Christ our Lord” (Rom. 5:21). Where does this faith that leads to eternal life and proper living come from? “Faith comes by hearing, and hearing by the Word of God” (Rom. 10:17). It Is The Most Attacked Book. Before time began, Satan, called Lucifer, challenged the person and character of God when he said, “I will be like the Most High” (Isa. 14:14). Then, in the Garden of Eden he again challenged God’s word by telling Eve to question it: “You will not surely die” (Gen. 3:4). Since then, no other book has been so viciously attacked throughout history. * And it is being attacked with greater antagonism today than ever before – banned from schools, prohibited by governmental regimes and destroyed by intolerant religions and nations. Unfortunately it is also being criticized and attacked by so-called liberal Christian theologians. Why? Because the Bible is exactly what it claims to be – God’s Word. It “is living and powerful and sharper than any two-edged sword, piercing even to the division of soul and spirit … and is a discerner of the thoughts and intents of the heart” (Heb. 4:12). In it man is totally exposed, and must either bow to its proclamation that all men everywhere repent (Acts 17:30), or attack its validity. The Bible is truth (Jn. 17:17). Does denying the truth make it false or unreliable? Does denial make it go away? The Bible asks and answers this question: “What if some did not believe? Will their unbelief make the faithfulness of God without effect? Certainly not! Indeed, let God be true, but every man a liar” (Rom. 3:3-4). And God has been proving the truth of His Word in the lives of His people since the beginning. No doubt, you have noticed that many Bible verses were used in this article as is customary throughout every edition of this magazine. This is because the Bible provides the only outline of truth (Ps. 19:7-11); as such, it is the most reliable source of historical data, provides the truest insight into a person’s being and gives the surest description of inter-personal and world conditions. The Bible also provides a perfect picture of our Creator and Savior God, the Self-existing One who reveals Himself on almost every page. Beginning with the damning details of fallen man, the Word of God also provides the direction for gaining and living the eternal and abundant life through Jesus Christ (Jn. 3:16), the One who is the Word become flesh (Jn. 1:1-4,14-18). No other book on earth can do all of these things. 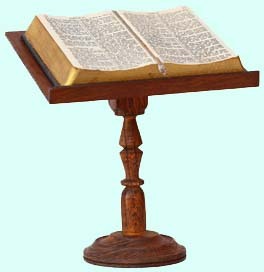 As we listen to and obey the gospel of our Lord Jesus Christ as recorded in the New Testament, and allow the Word of God and of Christ (all 66 books of the Holy Scriptures) to dwell within us richly (Col. 3:16), we become profitable to others, to the glory and honor of our God and Savior, Jesus Christ. That’s what the Bible claims it will do. And that’s very important. * In 300 AD the Roman emperor Diocletian ordered every Bible burned because he thought that by destroying the Scriptures he could destroy Christianity. Anyone caught with a Bible was executed. But just 25 years later Roman emperor Constantine ordered that 50 copies of the Bible be made at government expense. The French philosopher Voltaire, a skeptic, boasted that within 100 years of his death the Bible would disappear from the face of the earth. He died in 1728. Fifty years after his death, the Geneva Bible Society moved into his former house and used his printing presses to print Bibles ( The Evidence Bible, Ray Comfort, Living Waters, 2001).